New to Reference Recordings' Fresh! 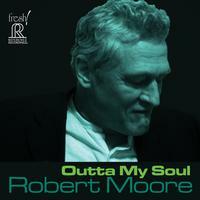 series is Robert Moore, jazz vocalist, composer, trumpet and harmonica player based in Portland. He has evolved a sound uniquely his own, mixing his Southern roots, influences of soul and gospel into his own distinct interpretations of bebop and swinging jazz. For more than 116 years, the Pittsburgh Symphony Orchestra has been known for its artistic excellence. The PSO has a rich history of the world's finest conductors and musicians. Past conductors include the legendary names of Reiner, Steinberg, Previn, Maazel,and other greats. This tradition was furthered in fall 2008, when celebrated Austrian conductor Manfred Honeck became Music Director of the Pittsburgh Symphony Orchestra.. Produced by Moore and recorded in high-res digital by innovative engineer Bob Stark, the album combines creative arrangements and outstanding performances by many of Portland's best musicians in a wide variety of settings from two to twelve. His music has steadily grown in depth, passion and honesty during his 60 years on the planet. Robert's well-seasoned, finelyhoned chops on vocals, trumpet, and harmonica are bringing joy to a wider audience than ever.